Sometimes we have to do a kids comic book, and this one fits into something we are seeing a lot of lately, the comic book game cross over. So this game/comic book is basically going to fit into both categories, a fun IOS game, that then gets released as an independent comic book to sell more stuff around the same set of characters. You can find the game in the Apple game store, and the comic books will show up at some point in stores or at some point online. Overall though it looks really interesting to read and enjoy. Something for the kids to do when they are not immersed in the game and help develop some of those reading skills they are going to need for school and along the way. From the official press release this is what we have, and this is what we know. Shazaam! Om Nom™, the loveable character from the award winning mobile game Cut the Rope™, is now a comic book hero! Millions of fans that play Cut the Rope have fallen in love with the adorable green monster. 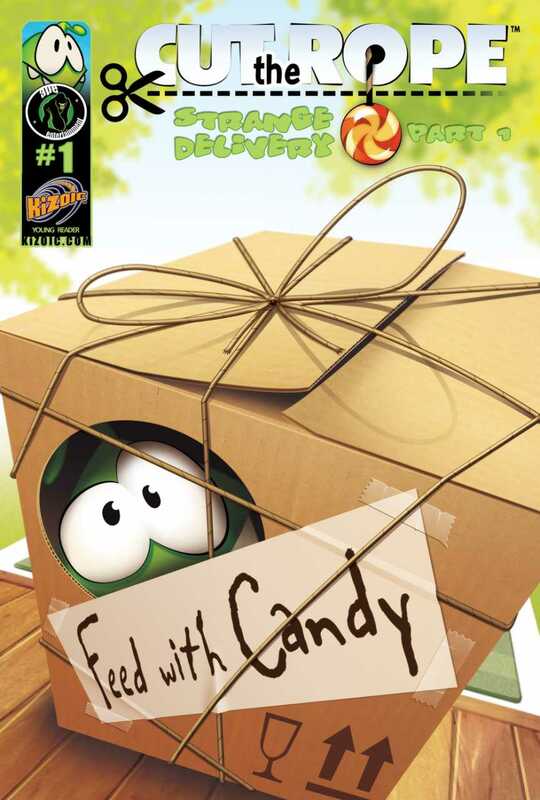 Now, through the new comic series released today in the App Store for iPhone, iPad and iPod Touch, they will start to learn more about Om Nom and his fascination for candy! Based on one of the most downloaded mobile games of all-time, the Cut the Rope No. 1 digital comic series begins in a quaint little town where opportunity sometimes knocks, but in thirteen-year-old Evan Coulton’s case, opportunity leaves a plain and uninteresting box on his doorstep. Of course, the surprise contents inside are anything but plain and uninteresting. Before Evan realizes what’s going on, both his kitchen and his life have been turned upside down by a little green monster with an endless appetite for sweets. Om Nom’s sugar levels leave him either high on energy or lazily collecting more candy, as he and Evan discover just how much they have in common. Fans can follow the adventures of Evan and Om Nom as trouble unfolds in one of the most anticipated new comic series today. ZeptoLab developed the digital comic series in conjunction with Ape Entertainment, who has a proven track record with comic book apps as demonstrated by the company’s success with the hugely popular Pocket God digital comic series. “With millions of fans around the world playing Cut the Rope, the new comic series provides the first glimpse into the story of Om Nom,” said Semyon Voinov co-founder, ZeptoLab. The first three issues of the on-going series are currently available on the iTunes App Store at www.apple.com/appstore/ – the first issue is free and additional issues are available for $1.99 through in-app purchase. Sounds interesting, let’s hope we can yank a copy of it over at the store.